Nice moment / pose, well captured - but the environment doesn't do it any favours as a pic, imo. As it's obviously a crop, I can't help wondering if there's other material available to allow you to 'adjust' things - especially the light patch behind junior's head? Thanks. I tried everything to mitigate the bright patch, I lowered the brightness, played with luminance, burned the area... Any suggestions? How dissatisfied / annoyed etc you are with the issue(s) that you consider need sorting / adjustment. Whether there's any external (to your viewing) use for the image after being 'sorted' (other than on sites like DG) ... and whether such adjustments are allowed. Cropped the left to get rid of the bit of tree trunk? You'd quickly get rid of some other distracting elements ... and, for free - reduce the area of bright splodge to replace. Alternatively ignore all of the above, accept it for what it is ... and move on ..
or slightly above said spot and replaced it with suitable bg material- for compositional reasons? It's a cute pic. As Paul suggests, there are a number of things that are possible, but to really do it well would take a lot of work. The hardest part would be masking the fur of the little one's head. Is it worth it?. If it were mine, I'd just leave it as is and look for a better angle next time but that's entirely up to you. Thanks guys. I tried playing with this in photoshop, but my skills are next to none, I need a class. Today I'm going back to try to find my little friends and re-shoot. Today I'm going back to try to find my little friends and re-shoot. The above essentially sum up my approach re waterfowl for the last 9 yrs or so - to the extent that now, I'll generally not bother taking the pic in the first place if I saw issues that'd be difficult to resolve after / stuff in frame* that I know will p me off big time. Re-visiting a known location, getting used to what's there, seeing how it changes through the seasons etc and becoming familiar with all of the factors associated with getting the sort of pic one's after is - for me - a more attractive option than traipsing all over the uk / globe just to be able to tick off species with shots that often just show I was there. something I've been known to do re certain sorts of bg issues - if the problems are caused by other subjects that move - but were present at the time of 'the shot' ... is wait for them to move and take other shots of the now clean bg - which allows me to substitute said clean bg info into the shot I want to keep. This, of course relies on being in the same location as the main shot and lighting / focus etc being appropriate. This, and similar techniques are also not possible if you're wandering around, waving a cam at whatever takes your fancy - irrespective of bg. Here is a different version, I backed out and somehow the bright spot, although still there, seems less offensive. Yesterday I went out again and discovered it is actually a pretty numerous colony, however, all the backgrounds, are a nightmare. I think tighter crop maybe...I would consider loosing three-quarter inch from bottom. I agree with TAZ, I would crop a lot tighter on all four borders and lose that bright blotchy background. 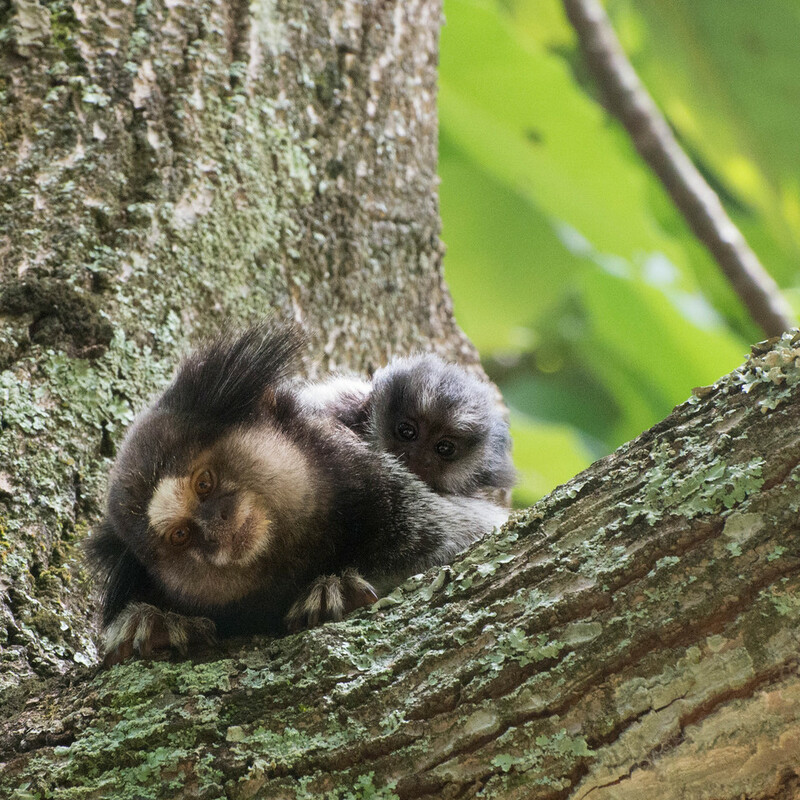 I like the marmoset and the infant ( they're cute ), but if you had taken one step to your right before shooting, you might have only had green leaves behind both of them, maybe. Thanks for the comments. I think that fixing the background issue with this pic is not possible (for me, at least). I will go and reshoot. In the mean time, I selected a couple other pics from that same day, where the background is less problematic. I have another suggestion, that may sound like heresy. What is the distance to your subject? I might think about a kiss with fill flash if the subjects are within 20 or 30 feet. A touch of fill flash with maybe -1/3-1/2 stop FEC might really help your subject to pop in front of the bright canopy behind it. Just a thought. 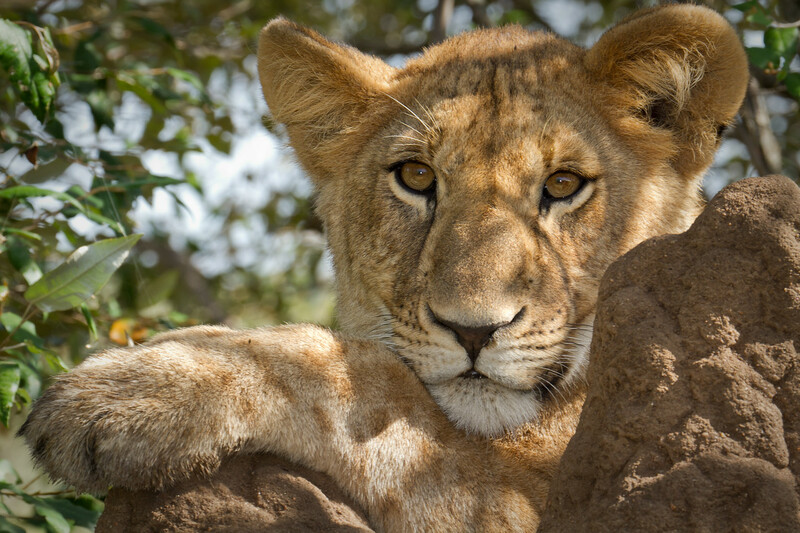 I have used fill flash with lions in the shade from time to time. They don’t even react to it. A little light on the marmosets faces with nice set of catchlights might be just the thing. Easy to do - set speed light in HSSynch, set FEC to -2/3 or so, and set your camera in Manual mode or Av mode, and shoot away.